This week, I’ve been experimenting with a Colonial method of fruit preservation called shrub. Used as a way of preserving soft fruits for winter. Also known as drinking vinegar, shrub is acidic but very fresh and fruity tasting. It’s a terrific way to use those fruits that are less than attractive, to give you fresh fruit flavors all year long. Once the shrub syrup has rested in the fridge for a week, you can combine it with water or sparkling water for a refreshing non-alcoholic beverage or add about an ounce to brighten up a cocktail. If you first taste shrub as soon as you mix the vinegar and fruit syrup, you’ll immediately notice it is bright and vinegary. Over about a week of resting in the fridge, however, the sugar, fruit, and vinegar continue to ferment until it reaches a stable condition where the acids have mellowed and the fruit flavors shine with bright freshness. 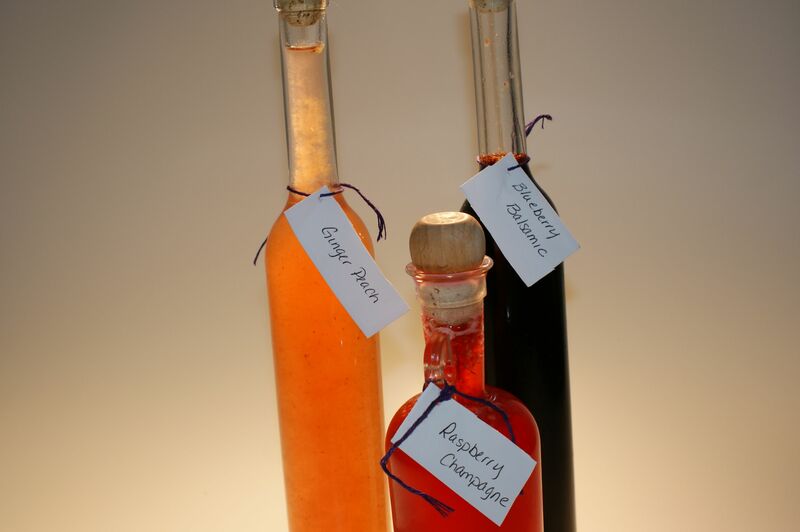 I’m making three different flavors of shrub – blueberry balsamic, peach ginger, and raspberry champagne. The flavor varieties are really endless, however, once you get the basics down. You can use any type of a soft fruit – plums, nectarines, peaches, berries, as well as aromatic herbs and spices. I saw a recipe for blueberry cinnamon that uses a cooked syrup, for example, and I saw another recipe for a cucumber basil shrub. Many recipes call for cooking a simple syrup, and then steeping it with the fruit before adding vinegar. I am using a non-cooked process, however, in which you macerate the fruit with sugar for a few days, and then strain the solids off and combine the resulting juice and residual sugar with the vinegar. Roughly cut peaches and mash them in a non-reactive bowl. Add sugar and ginger. Stir well to combine. Cover and refrigerate for a minimum of 24 hours, stirring occasionally. Use a wire mesh strainer to strain solids into a large glass measuring cup. Press lightly on solids to extract all of the juice. Scrape any residual sugar from the bottom of the bowl into glass measuring cup. Pour juice and sugar from the cup into the jar. Seal tightly and shake to combine. Store in the refrigerator for one week, shaking vigorously once or twice a day to combine any sugar that settles to the bottom. Mash blueberries in a bowl and mix with sugar. Macerate, covered in the refrigerator for at least 24 hours. Strain juice from solids and scrape any remaining sugar from bowl into a glass measuring cup. Pour vinegar into a sterilized one quart mason jar. Add strained fruit juice and sugar to jar. Seal tightly and shake well to combine. Refrigerate for one week, shaking a few times daily to dissolve any sugar. Mash raspberries in a non-reactive bowl. Add sugar and stir well. Cover and allow to macerate in the refrigerator for at least 24 hours. Use a wire mesh strainer to strain off solids into a glass measuring cup. Scrape any remaining sugar from bottom of bowl into cup. Pour champagne vinegar into sterilized mason jar. Pour juice and sugar into jar. Seal jar and shake well to combine. Refrigerate for one week, shaking the jar once or twice a day. Shrubs will keep in your refrigerator for one year. Add one ounce of shrub syrup to 8 ounces of water or sparkling water. Use a jigger in cocktails. Avoid cocktails with citrus fruits because the shrub will be acidic and if you combine it with citrus you’ll have two times the acidity.